Located in the heart of the Mexican Caribbean, this gorgeous all-inclusive resort offers an array of activities with a prime beachfront location. Surrounded by tropical foliage, the resort offers sweeping views of the Caribbean and a magnificent white-sand beach with crystalline waters. Guests can indulge in a variety of dining options, including Mexican cuisine, Italian favorites, and Japanese cuisine. Accommodations include elegant rooms and areas with beautiful ocean views. 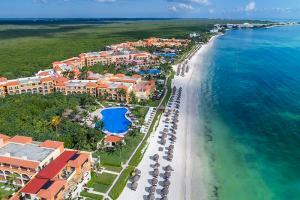 Located about 14 miles from Cancun International Airport.